Four-year-old Alex Brown grinned ear-to-ear when he visited the Stanley Cup after the Pittsburgh Penguins 2009 championship win. Already an avid hockey fan, he had received skating lessons for his birthday. But life had a different plan when just a few days after seeing the trophy, a spontaneous spinal epidural hematoma left Alex with a C8 level spinal cord injury. Founded in 1998 by the parents of three young boys diagnosed with spina bifida, Mighty Penguins Sled Hockey operates therapeutic and competitive adaptive ice hockey programs in the Pittsburgh, Pennsylvania, area. Created to support physical fitness and encourage sportsmanship, the organization has a busy schedule with weekly practices, local and travel games as well as hosting a major annual tournament. 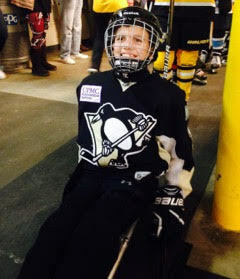 In 2017, the Mighty Penguins received a Christopher & Dana Reeve Foundation Quality of Life grant to support program expansion by purchasing additional equipment, including eight sets of sticks, five traditional sleds and three custom high back sleds with chest straps and additional supports for players who are challenged with balance and core strength. The Mighty Penguins organization was already familiar with the Reeve Foundation from a 2014 Quality of Life Grant it received through their partnership with the Pittsburgh Penguin Foundation. That grant supported the addition of an intermediate-level team. Today, the program serves more than 70 players on four teams ranging in age from five to over 60. 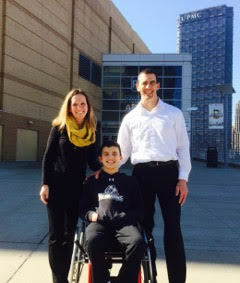 For the Brown family, the Reeve Foundation plays an even larger role as a resource for life with a spinal cord injury. Amy says the Reeve Foundation was the first place she turned to when Alex was injured and it has since served as her primary source for research and information. Each summer, Alex spends 12 weeks at the NRN. Alex has also gained more bladder and bowel control. He is able to take steps and is working on bearing weight. Of course, the family also brings Alex’s hockey sled along each summer to get some ice time in. This fall a second NRN pediatric site will open at the Children’s Hospital of Pittsburgh of the University of Pittsburgh Medical Center and the Brown family is proud to be part of encouraging the site location.